New Page Books, 9781632650375, 272pp. We often feel powerless in our lives. We have many desires but are limited in our ability to transform those wishes into tangible results. We are confused and unsure about what will really make us happy. In Eternal Dharma, Vishnu Swami guides you on a journey to align yourself with the natural flow of existence through the ancient Eastern knowledge of Veda. 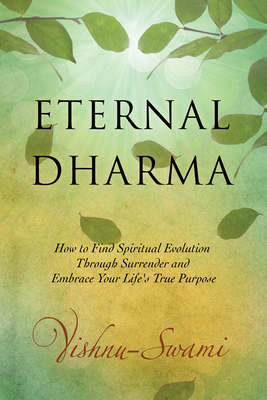 Eternal Dharma distills 5,000 years of spiritual wisdom so you can learn to live an enlightened, effective, and fulfilled life. Explore the subtle and physical domains to achieve a totally new relationship with reality. Learn the radical new system of effectiveness. Gain clarity on all spiritual and religious paths. Free yourself from pain and suffering to reach pure, transcendental love. Vishnu Swami, also known as the Maverick Monk, relocated to study Veda at a monastery in India at the age of 11 and later became the youngest swami to be honored with that position at the extraordinary age of 23. He has appeared on television and radio and in newspapers internationally, and was featured in an award-winning spiritual documentary in Hollywood. He continues to empower and inspire thousands through his writings, speaking, and online college-accredited courses at Vishnu-Swami.com. "We launched some of the best titles in the world--Chicken Soup for the Soul, The Secret, Rich Dad Poor Dad, Men Are From Mars--I can't count them all. We've broken the Guinness Book of Records six times and Vishnu Swami has written something internally that is going to bring a transformation to you that's like Uncle Ben's Minute Rice; you're going to set the timer on your microwave oven, read through these pages, and you're going to have an eternal shift that is going to forever change you.